The Hotel Tyrol in Oberstaufen offers an indoor pool and a free breakfast buffet. All rooms and suites have a balcony with wonderful views of the mountains and forests. A wide range of healthy foods are served each morning at the Tyrol. Bavarian, Swabian and international meals offered in the Hotel Tyrol's restaurant with summer terrace. A cosy Staufen-Stuben lounge is also available. The Hotel Tyrol offers rental bikes to help you explore the beautiful Oberallgäu countryside. Guests also receive a free ski pass, free parking, and inclusive use of the mountain railway. A sauna, steam room and infrared cabins are also available at the Hotel Tyrol. When would you like to stay at Hotel Tyrol ? No extra bed for children. Spacious suite offering separate living/sleeping areas.No extra bed for children. Each day we'll check prices and send you an email for your selected dates at Hotel Tyrol. If you don't have specific dates but would like to check prices for say next weekend or say next month we can check the price too. 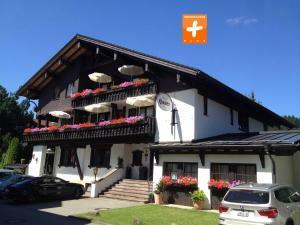 Click to write a review and share your experience of Hotel Tyrol with other travellers.